When we first brought home our Golden Retriever puppy Ellie, she had a very black nose. Over time and especially after her first winter her nose started to turn lighter, and now at age 3 her nose is pink, and it hasn’t changed back. What is Golden Retriever Snow Nose, and what causes it? The Term “snow nose” is a common condition that not only affects Golden Retrievers but also Labradors, Siberian Huskies, and other breeds that have a white or light colored coat. It happens when a dogs dark nose loses pigment and becomes lighter. A dark nose can turn brown or pink. Snow nose occurs in the winter months when there is a loss of sunlight, and is sometimes called “winter nose”. Snow nose doesn’t occur because of the snow, but it gets the name snow nose or winter nose because the nose loses its color pigmentation when the daylight hours are shorter in the winter months. Some dogs noses will return to their darker color in the summer months, but some dogs as they get older will keep their light colored noses all year round. The term snow nose doesn’t just affect dogs living in cold climates, but it has also been reported to affect dogs living in warmer climates as well. The temporary loss of pigmentation on the nose is a cosmetic issue that does not harm your dog and there is no need to be concerned. As your dog ages the color change can become permanent, the nose will still be healthy but just lighter than before. Snow nose is not a health concern, but if you notice any changes in your dogs nose such as crusts, sores, discharge, sneezing or wheezing, you should consult your vet. A loss of pigmentation in the nose can also be caused by an underlying thyroid condition, and you will want to consult your vet to get thyroid levels tested. Another cause of pigment loss in your dogs nose could be from contact dermatitis. Some dogs have a sensitivity to plastic, and continued exposure to it will lighten their nose. 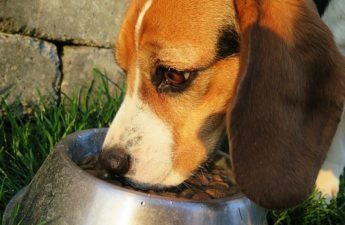 If you use a plastic food and water bowl, it is best to switch to stainless steel or ceramic bowls. Can Snow Nose Be Treated/Prevented? There is nothing that can be done to prevent or treat snow nose. As mentioned above, the loss of pigmentation in the nose can be a temporary seasonal thing for some dogs, and for other dogs it can be permanent all year round. Snow nose does not cause any harm to your dog, nor is it associated with disease. It is a cosmetic issue, and there really isn’t a lot of knowledge as to why it happens to some dogs and not to others. If your dog has a naturally pink nose, or it has turned pink temporarily, or permanently, you will need to protect your dog from sunburn. Just like humans with fair skin, dogs with pink noses are at risk for sunburn, and need to be protected from the sun. A great way to protect your dogs nose from getting sunburned is by applying Natural Dog Company Snout Soother, which is an organic all natural sunscreen for dogs. Snout Soother is a fragrance free, 100% natural soothing balm, that contains ingredients like Shea Butter, Coconut Oil, Hempseed Oil, and Natural Vitamin E. No need to worry if your dog licks it off, it is all natural and will not harm your dog, as long as you continue to apply the balm it will offer protection. Snout Soother is also great for dogs dry cracked noses, it prevents windburn, heals rashes and skin irritations, and helps with many other nose conditions. It is great for humans too for chapped lips and dry skin. If you have a dog whose dark nose has faded to pink during the winter months, then rest assured it is snow nose, and it is not harmful to your dog. However, if your dog has other changes occurring in his nose such as sores or discharge it is best to consult your vet. Remember to take special care of your dogs pink nose as it will sunburn easily. I do hope you have enjoyed this article, I would love to hear from you about your dogs snow nose. Please leave a comment. What great information and it is a term I have never heard of. I have had 3 Golden Retrievers (best dog ever), and on one of them his nose turned more of a brown color eventually. Another one that is very blonde in color, his nose is still black but has turned pink on the top where his fur starts. It has concerned me more in the summer months, because when I first noticed it, I was afraid that he had gotten sunburned. I had never heard the term snow nose, or I guess gave it much thought as to why their noses had lighten up. I appreciated the information on sun protection for their nose. Like I mentioned, I was concerned that one of my dogs had gotten too much sun and that is why it was more pink. I didn’t realize that I needed to protect it from getting sunburned. Thanks for giving me some new insight. Hi Marla, thank you for commenting. I am so glad to have given you some new information and insight. My Ellie is very blonde in color and her nose turned pink after her first winter, and has stayed pink ever since. With a pink nose, you really need to protect it from the elements like cold winter air and the hot sun, so it doesn’t get sunburned. The Snout Soother is really great at protecting your dog’s nose. Again something new I learn about dogs. I haven’t given the color of the dog’s nose much thoughts. It’s interesting to learn though that these bizarre phenomena exist. I wanna check my dogs here now. Although we never have snow in this region I want to see if they still have “snow noses”. Hi Stefan, thanks for your comment. There is always something to learn about dogs, I have learned so much from being a First Time Dog Mom. The pink nose does look cute, and it is good that it is just a cosmetic issue. Oh my, that picture of the dog covered in snow reminds me of our Cyrus. He is a clown and always runs his face into snow any chance he gets and then he shakes and snorts, it’s a riot. I am so glad you said that “snow nose” is just cosmetic and nothing to worry about. That’s what I thought, and I’m so glad that is the case. As a Dog Mom, I worry about everything, as I’m sure you do as well. Great site! I love it! Thank you for your comment. Yes, “snow nose” is a cosmetic thing, my Ellie’s nose is pink, and stays that way all year long. I am so glad you enjoyed my post and my website. I have never heard of snow nose before, I guess as long as the dog is in good health and is not bothered by it it’s okay. Does the snout soother help to keep the pigmentation or is it just to make sure the nose stays moisturized and doesn’t get cracked in the winter? I don’t have a dog, but have been considering getting one in the next while. I like the golden retrievers. Are they a pretty mellow dog? Thanks for your comment. The Snout Soother helps to keep the nose moisturized, and protects it from any sunburn. When a dog’s nose turns pink “snow nose”, it needs more protection from the elements, like cold and sun damage. Just like us humans who have fair skin, we need more protection from the harmful UV rays. In response to your 2nd question, Golden Retrievers are a great dog for first time owners, they are very easygoing. If you want further information, please check out some of the posts on my website, like: Living With A Golden Retriever, and Best Dog For First Time Owners. Very helpful information, wish I’d known about this when my dog was still alive. She had the “winter nose” for quite a while. We didn’t know if it was a health problem or just a sign of old age. Thanks for the info! I’ll remember this post when we get a new dog :).